a few days holiday to spare. It`s the perfect gift for very special occasions. 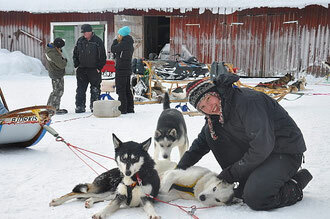 Transfer from the airport in Arvidsjaur to Lapplands Drag huskyfarm. Arrival, you will get shown to our cosy accomodation. upon then before eating dinner together. In this friendly atmosphere we prepare the coming days and the tour. After a generous breakfast the adventure begins. We start by feeding the dogs and then we prepare the sleds together. You will be introduced to dogsledding and how to handle our sleddogs. Our guide helps you harnessing and starting off if needed. across frozen rivers and through white forests. Whwn we return to the farm we cuddle and eed the dogs ogether. (grillkåta) and we will spend the evening in front of an open fire. After breakfast we will prepare the dogs and the sleds together. A wonderful winter wonderland awaits you also today. Dinner is served in the main house today. A hot sauna rounds off the evening. after packing you have to say goodbye to "your" dogteams. After the breakfast we take you back to the airport. on a husky farm as they are with us a lmost all the time and help us feed, cuddle and take care of the sleddogs. helping hand available where it is needed. Fresh breakfast, lunch and a 2-3 course dinner are served daily and we eat together. to place pike traps together under frozen ice and then to check them the fpllowing day. The snowmobiles will help us to move around.